It’s no wonder — the already decadent confection is served alongside a dollop of coffee ice cream infused with crackly cocoa bits, and any one who tastes it is likely to be up late writing about it. The tart itself starts from the bottom up with a soft crust, a thick layer of gooey caramel, a dark-chocolate coating and a dusting of sea salt. The menu recommends pairing it with Arrosta Cofee, coffee liqueur that’s made in small batches by Boulder’s own Vapor Distillery, using hand-ground and cold-brewed Madagascar bourbon vanilla coffee beans. It’s no coincidence that Salt recommends a locally produced beverage to accompany the tart. In fact, the restaurant’s menu is built around fresh ingredients that are grown as close to its Pearl Street Mall location as possible. Salt’s farm-to-table principle, which is shared by a growing number of stellar restaurants in the area, is no doubt one of the reasons Boulder was recently named the foodiest town in the U.S. by Bon Appetit. 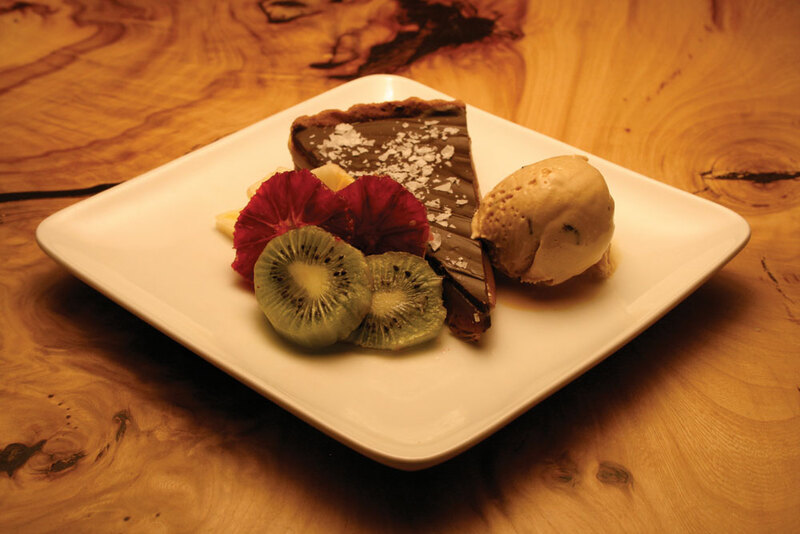 We’re pretty sure the dark chocolate caramel salt tart is another one. Photo: Courtesy of Salt Bistro.